Now You're Talking! 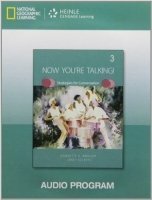 is a three-level strategies-based conversation series designed to help learners develop natural spoken English skills through a wide range of contexts and topics. Guided listening and speaking activities prepare students for the types of real-life conversations they encounter in their daily lives.